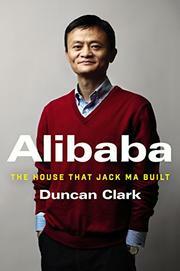 A study of the multibillion-dollar Chinese e-commerce conglomerate and its charismatic founder. Technology and financial expert Clark astutely profiles Jack Ma, the 51-year-old entrepreneur behind Alibaba, “the Amazon of China” that has become the world’s largest online shopping mall. Having met Ma in 1999, the author recalls the former English lecturer’s remarkably ambitious spirit and his intentions to overthrow the giants of Silicon Valley with the development of an unrivaled Internet-based business. Ma was backed by only a small handful of co-founders (his wife included), but the author pitched in and became an adviser to Alibaba in its infancy as it developed and gained a competitive edge through what Ma calls the “iron triangle” business plan: e-commerce, logistics, and finance, all of which Clark outlines in lucid detail. Further embellishing his portrait, the author also draws on his 20-year tenure living and working in China, and he shows the great impact of the multifaceted online experience on the country’s financial and cultural climates. Clark cites the 2008 global financial crisis as the tipping point when China’s economic focus turned inward to boost its own economy instead of primarily exporting goods overseas. Alibaba took the lead, launching itself with an online payment system and a host of subsidiary sites, which attracted small businesses to sell merchandise through their Web portals with no fees. Noting that the company remains governed by a “customer first, employees second, and shareholders third” philosophy, Clark contrasts Alibaba’s camaraderie-centered campus culture, including employee incentives and commitment awards, with its initial struggle to find startup investors and earn commercial credibility. The author frequently highlights Ma’s quirky, often contrarian personality and risk-taking management style. A particularly vigorous chapter on the struggle between Alibaba and e-commerce titans eBay and Yahoo for profitability and marketplace saturation in China dramatically demonstrates the volatility and competitiveness between businesses seeking to harness Internet consumerism. Useful, business-minded reporting on an unconventional corporate magnate, containing both corporate and human-interest perspectives.